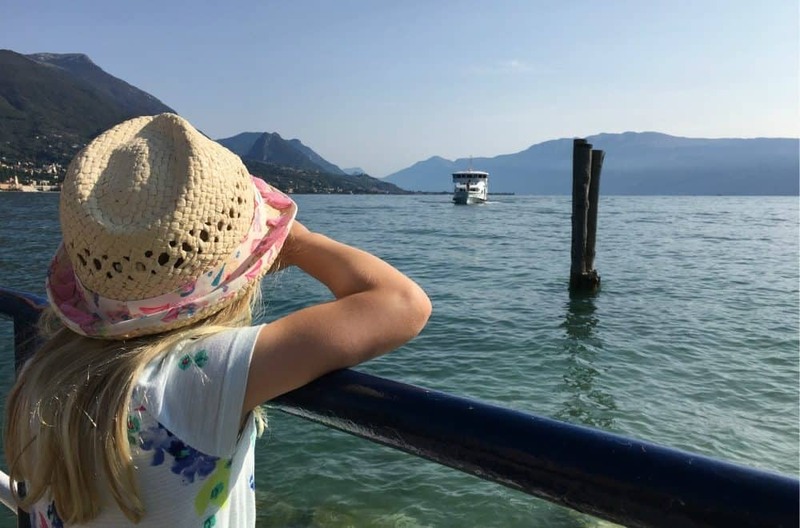 If you’re looking for a campsite in the Italian lakes with great facilities for families and stunning views then we can recommend Camping Eden, Lake Garda. We were invited to stay there with Al Fresco Holidays in August and loved the site. Here’s our Al Fresco Holidays review and guide to staying at Camping Eden including a tour of our Al Fresco Holidays Vivaldi 2 mobile home, the onsite family entertainment and what there is to do in the area. What comes with your Al Fresco Holidays Vivaldi 2 mobile home? 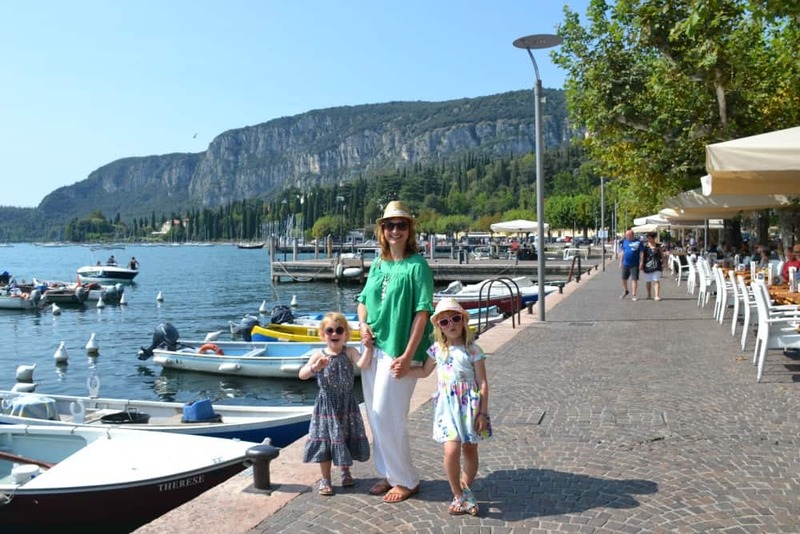 What are the best things to do in Lake Garda? Verona Airport is the closest airport to Camping Eden. We flew with Flybe from Southampton. You can also get flights from London or nine other regional airports in the UK. Once you’ve landed and collected your luggage you have a one hour drive to reach Camping Eden at San Felice del Benanco on the west side of Lake Garda. A car is essential for reaching Camping Eden as the closest train station is a 30 minute drive away at Desenzano di Garda. We picked up our hire car from Enterprise at the airport. All the hire car companies can be found easily by turning left out of the airport terminal and walking a few minutes along the pavement. Be aware that you pick up your hire car in a covered car park so it is dark. Take extra care to check your vehicle for damage before you sign for the keys. Once you are on the road take the SP26A and join the A4 Autostrada towards Milan. This is a toll road where you take a ticket on entry and pay on exit. The toll for our journey was €1.90. The toll booths are automated and take notes so you don’t have to worry about having the correct change. You leave the Autostrada at either SP567 signposted ‘Desenzano di Garda’ or continue to the next junction signposted ‘SS45bis’ or ‘Salò’. There’s a few minutes difference. The SS45bis is the quicker road but longer route. We had a bit of a dramatic night time journey to Camping Eden in the middle of a storm, so there were a few wrong turns and lots of hairy moments on flooded roads before we reached Lake Garda. However, even in the torrential rain finding Camping Eden was a cinch once we’d seen sign posts for Salò. The site itself is well sign posted within a mile or so. We arrived really late in the evening (it looked quite different to the picture above!) so our mobile home keys had been left in the Al Fresco Holidays reception which is a short walk from the main reception and restaurant. There was an envelope for us with a map showing the location of our accommodation and a note telling us to make ourselves at home. It was such a relief to be in the warm and dry that we took it in very good humour that the bedding and towels that had been ordered as part of our booking were nowhere to be seen. We later found out there had been an error somewhere in the booking system. The following morning we checked in properly with our Al Fresco Holidays reps and they quickly sorted out our linen and towels. The only other things to do on check-in are to have your passports ready to be checked and have a €60 refundable cash deposit for any damage during your stay. You mobile home is inspected and your deposit returned by the team before you depart. Camping Eden has a variety of accommodation options. There are: touring pitches for caravans, tents and motorhomes; mobile homes; and some chalet accommodation. The site is terraced and the pitches towards the bottom of the site felt a lot closer together than at the top. However, there was still enough room on each pitch for the various types of accommodation and a parking space. Some larger cars did hang out onto the road in our row of mobile homes but with a bit of shuffling it was possible to park. The views of the lake were better as you moved up the site as well but we could still see smokey blue mountain tops from our mobile home decking each morning. We have stayed in an Al Fresco Holidays mobile home before so knew that we could expect good indoor and outdoor living spaces. Our Vivaldi 2 at Camping Eden was a six birth mobile home with a central sitting and dining area, which we used as somewhere for quiet time after a dip in the pool or chilling out in the evenings after the kids had gone to bed. Off the main living space there was a bathroom with sink, shower and storage shelves, a separate toilet, a double bedroom with wardrobe and storage, and two twin rooms each with a wardrobe and shelving. There is also a large cupboard with hanging rails in the central living space. In here there were some extra chairs. The kitchen came with a medium sized fridge and small freezer, microwave, sink, oven and hob. There were plenty of pots, pans, bowls, crockery, utensils and lighters. You also get a clothes airer for indoors, a gate to put across the entrance to your decking to keep young kids safe, and a mop and bucket. There are electric fans in each room. But if you are staying at Lake Garda in the summer months we can recommend adding the air conditioning to your booking. Outside there’s a decking with a table and four chairs, two reclining chairs, and two sun loungers. For cooking there’s a charcoal barbecue. At Camping Eden you also get a sink outside which came in really handy for washing up the barbecue and any greasy utensils. I’ve already mentioned that we ordered the Al Fresco Holidays family linen pack. This is well worth getting as it cuts down on luggage. The Al Fresco Holidays family linen pack includes top and bottom sheets plus two pillow cases for the double bed and a top and bottom sheet plus one pillow case for two single beds. There are also four bath towels in the pack. We had an extra single linen pack as there were five of us staying. You can also book beach towels which come in packs of two. It’s worth mentioning that there’s no bath mat or tea towels in the linen pack options. Tea towels are available from the shop or you can pack them yourself. We found our mobile home really well equipped with all the utensils and cooking equipment we needed for our break. But we could have saved a bit of money during our holiday if we’d brought along a few small consumable items. The only consumables in the mobile home when we arrived were a toilet roll, two bottles of water and two cans of lager in the fridge. Al Fresco Holidays have a supply of cleaning products for surfaces, barbecues and bathrooms in their reception, so there’s no need to buy cleaning liquids. You can also borrow games and books from their reception. Camping Eden has three swimming pools in two complexes; one at the top of the site and one at the bottom. We spent all of our pool time at the lower pool as this was just a few minutes walk from our mobile home. The girls clocked up hours of fun zipping down the small slide in the children’s pool and running around the splash park with water jets firing off in all directions. Baby and I braved the larger slide in the main pool a few times too. I’m a bit sad we didn’t make it to the other pool at the top of the site which has yet another slide, lawned areas for sun bathing and even better views of the lake. But an up hill walk with the girls put me off. The good thing for families staying further up the site was that they didn’t need to walk all the way down to get a swim – so there was good distribution of facilities on the campsite’s part. Something that we didn’t realise until we got to the pool on our first morning was that swim caps are obligatory for hygiene reasons. You can buy these from the campsite shop for €1.80 or bring them from home. The Camping Eden pools are open from 9am to 7pm daily during the summer season. The private beach was Tot’s favourite place to swim and I couldn’t disagree with her. The views across Lake Garda were perfect. There was a pontoon stretching out into the lake and loads of kids were enjoying jumping in. Tot and I floated around in the clear waters for ages watching speed boats and ferries passing by. The beach also has a shady grass slope where you could roll out a towel and relax. All this was just a few minutes walk from our mobile home, across the road from the campsite entrance. There are two play parks at Camping Eden plus a sports court for hire. Tin Box Grandma and I took it in turns to take the girls off for a play when food was cooking. They loved finding new friends on the roundabout and climbing frame while we absorbed ourselves in the view. The campsite shop opposite the main reception was really well stocked with fresh and store cupboard food at convenience prices. Each morning there was lots of fresh bread and croissants, and no need to preorder. However, you had to get there before 9am to get a good choice. The shop was open until 7pm daily. Something to be aware of is that the shop is cash only. The campsite’s card transactions are done over a phone line and, as we experienced in the restaurant, these can take a while to process. The closest large supermarket, Simple, is in Salò a ten minute drive away. You’ll find it on Via Maria Montessori. The entrance to the car park is off a roundabout and you park on the roof above the shopping precinct. We got charcoal and lighters our barbecue from here. Camping Eden’s restaurant is excellent. It has a proper Italian menu with anti-pesti, pasta for second course, meat and seafood mains, and desserts. We visited on our first evening and I couldn’t resist the fresh tortellini with sea bass and crayfish followed by the tiramisu. A two course meal for four (the girls shared a large Margarita pizza) with wine cost just under €80, which isn’t bad for the quality and the wonderful view of the lake. On our last evening we got pizza to takeaway. There’s a small additional charge for this. The restaurant is where there’s also evening entertainment. But with full days of swimming and sightseeing we didn’t have the energy to make it. We could hear what sounded like professional singers most evenings, so I’m gutted that we didn’t experience the entertainment for ourselves. We did however make it up to the roof bar for cocktails. At €7 a cocktail it wasn’t something we’d do every night but it was a nice treat with a good view. Camping Eden has a tourist office on the side of its main reception that offers excursions through Tickets & Tours, as well as general tourist information. If you’re looking for things to do from Camping Eden with children you can walk along the road to the small port town of Portese where there are restaurants around the harbour. It takes about 15 minutes to get there when walking with little people. It’s a good spot to watch the comings and goings of the passenger ferries that can take you all over the lake. You can also catch the Dotto tourist train from outside the campsite. This takes you on an hour long circular route around the resort of San Felice del Benanco for €2 per adult. Under sevens ride free. On Saturdays the train also stops in Salò for the market. From Portese you can get a passenger ferry to other parts of Lake Garda. You may need to change at Salò for ports in the north. We boarded at Portese and took a day trip to Garda on the East side of the lake. The boat, operated by Navigazione Lago di Garda, calls at a few ports on the way giving you the chance to get a glimpse of other gorgeous lakeside towns like Gardone di Garda. Garda is a bustling resort town with plenty of tourist, glass and clothing shops down pretty streets. Along the lake side there’s an abundance of restaurants and cafes where to can buy a coffee and people watch, enjoy a traditional Italian four course lunch or dive into a chilled bowl of gelato. On either side of the marina there are public beaches. We visited the one at the southern end with a stone sunbathing deck from where you climb down rocky walls into the cool waters of the lake. At the other end of the town we saw a stoney beach just along from Garda Beach Cafe. The boat journey to Garda took just over and hour and slightly longer on the way back. We spent four hours there before returning later in the afternoon. This trip cost: €63.20 including a discount for a family ticket. You can also get day tickets for the whole lake which allow you to get on and off the ferry at ports as you please. This costs €34.30 for adults and €17.60 for children. Salò is a Medieval town with history stretching back nearly 1,500 years. It boasts Lake Garda’s longest promenade along which you can find hotels, restaurants and the marina. If you step back a street you’ll wander past shops selling designer and high quality clothing as well as the obligatory gelato. A stroll around the old town with its pretty streets and Medieval walls is a lovely way to spend an afternoon. You can get a ferry from Portese to Salò’s Piazza Dal Vittoria in the old town. This costs €6 per person (aged over four-years-old) for a return trip. Salò is also an easy 10 minute drive along the lake front. There is limited on street parking in town and larger car parks we saw were a bit of a walk away from the promenade. My advice would be to make an adventure of it and take the ferry. Venice needs no introduction and was one of the places we said we had to go before we even arrived in Lake Garda. It’s a three hour journey from Camping Eden when you factor in driving, trains and ferries. We had been thinking about taking the train but decided to drive in the end. We booked parking and the ferry to Venice though Tickets & Tours at Camping Eden. This cost €8 for parking at Terminal Fusina, and €13 per adult and €6 for children aged three to 12 on the ferry. With about €30 of fuel to get us there from Lake Garda and €22 in toll road charges the cost worked out about the same as the €112 train fare for us all but we had more flexibility about when we travelled. You can never underestimate the importance of flexibility when sightseeing with kids! I’ve written in more detail about our day trip from Lake Garda to Venice. While in Venice we took a child-friendly tour with Macaco Tour. If you have young kids and are planning a visit here you might be interested in reading my Venice tour review. If you are looking for extra inspiration for family fun during your Italian Lakes holiday then read my post about more things to do in Lake Garda. This is an excellent Lake Garda campsite for families in a great location for exploring the area. Our girls loved the swimming pools and we enjoyed the convenience of staying in our Al Fresco Holidays mobile home close to all the facilities, especially with young children. And who could forget all the opportunities we had to appreciate Lake Garda’s scenery?! Aside from the linen issue on our first night our second experience of holidaying with Al Fresco Holidays was a great success. Our reps on site were very helpful and gave us lots of tips on where to shop, eat and things to do. 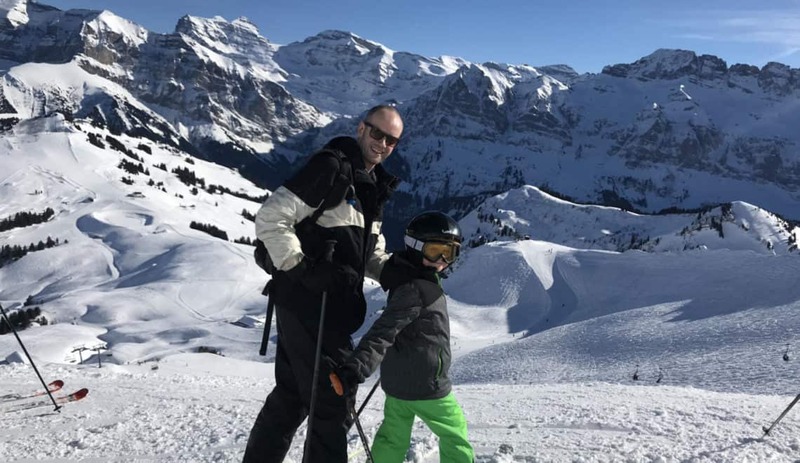 If you’d like to find out more about holidays with Al Fresco Holidays in the area then Camping Eden is one of six campsites where you’ll find them offering mobile home holidays in Lake Garda. If you’re interested in France as an Al Fresco Holiday destination, read our review of Yelloh! Village Le Pin Parasol in the Vendee region. Disclosure: we were guests of Al Fresco Holidays and received our accommodation, car hire and flights in exchange for coverage on the blog. We paid for our own food and excursions during our stay. If you’re planning a Lake Garda camping holiday then pin this post for later. How nice that there was a private beach at the campsite. Did it get very busy? We love these sorts of places – one thing that’s really helpful in this post is the description of what comes in the packs. It varies between the different operators, and we usually err on the side of caution, packing up the car with tea towels, washing up liquid etc – but that’s not always possible when you’re flying. Great post! Thanks Nell. Glad you found the family linen pack useful. It’s always good to be prepared! The beach was buzzing with people all day but it wasn’t overcrowded. Not bad considering it was the end of August and baking! No, we didn’t get to Gardaland this time. I’d love to go back and do it when they are a bit older and can appreciate all the rides! I’ve never gone camping….yet. But thoroughly enjoyed reading about your experience. It was a fabulous location! Glad to have given you come inspiration! This is such a great resource for anyone planning a trip to Camping Eden. Having the beach and pool was incredible. The girls had a brilliant time! This looks like an absolutely lovely place to go camping with the family. It’s a nice balance between having amenities and getting away to nature. It’s also wonderful to have both a pool and a beach. From experience, it’s surprising how nice it is to have both for the kids. Wow this looks perfect! I love the views from the campsite and the private beach. Before we went to a Eurocamp in Tuscany this year I was looking at mobile homes in Lake Garda and I think it might be next on our list for a summer holiday after seeing this. It’s a wonderful part of Italy – you’ll love it!